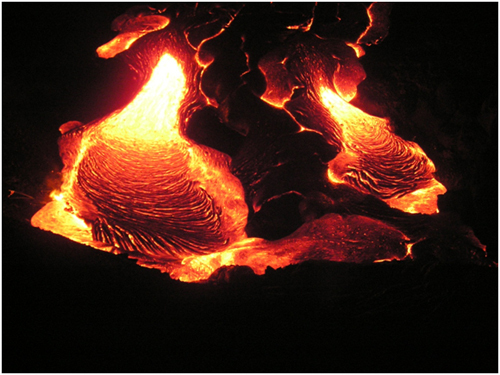 The temperature at which active lava is erupted correlates well with the composition of the lava. Mafic lavas may be up to 200-330 degrees celsius hotter than felsic lavas. The range of temperatures observed on active lava surfaces can also be used to determine the style with which the lava is erupted (i.e. as aa or pahoehoe lava flows, as lava lakes, or as lava domes). This is possible because the ease with which the crust is fractured depends on the volumetric flux of lava and its rheology (Image 2). As a result, lava bodies that fracture their cool crusts more easily (like aa flows) have hotter temperature distributions than those that fracture their upper surfaces less readily (such as viscous lava domes). Image 2: Image of active pāhoehoe lava flows at Kīlauea volcano,Hawai’i. A recent paper (Wright et al, 2011) used thermal infrared satellite data acquired by NASA’s Earth Observing-1 Hyperion hyperspectral sensor to demonstrate how well the eruption style and lava composition could be determined for a suite of terrestrial lavas of known eruption style and composition. They conclude that the style of volcanism and the composition of the lavas can be constrained on the basis of thermal remote sensing data alone, provided an adequate spatial and temporal sample is available. Jupiter’s moon Io is the most volcanically active body in the solar system (McEwen, 2002) (Image 3 and 4). The detection of very high temperature volcanism–hotter than any terrestrial lavas currently erupting–was one of the most spectacular discoveries by the Galileo mission at Io. 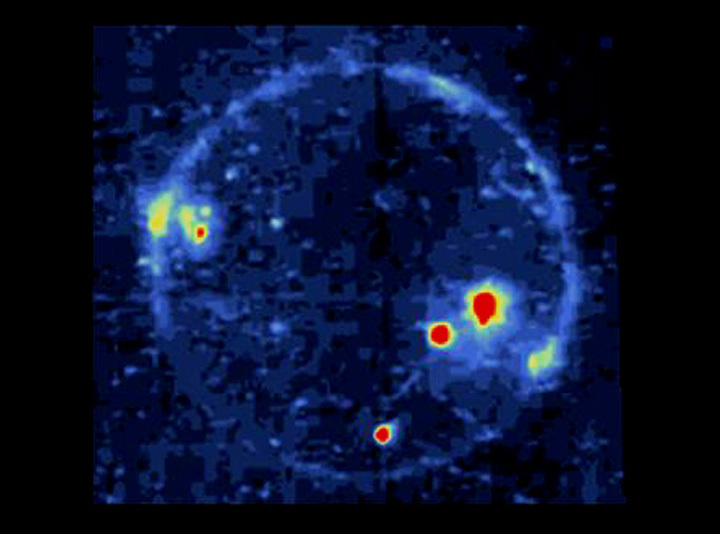 The bright spots in Image 4 indicate the locations of active volcanic vents on Io. This image and other data from NASA’s Galileo spacecraft indicate that the lava at Pillan Patera (the brightest spot) exceeded 1,700 degrees Kelvin (2,600 degrees Fahrenheit) and may have reached 2,000 degrees Kelvin (3,140 degrees Fahrenheit). The hottest eruptions on Earth today reach temperatures of about 1,500 Kelvin (2,240 degrees Fahrenheit), but hotter lava erupted billions of years ago. Image 4: Volcanic eruptions seen on Io during an eclipse. The image is color coded so that blue to yellow to red represents increasing brightness. The bright spots indicate the locations of active volcanic vents on Io. Image source from NASA. Thermal infrared satellite data acquired by the Galileo mission have allowed inferences to be made regarding the style of volcanism prevalent on Io, as well as the chemical composition of the lava, which in some instances may be ultramafic (McEwen et al, 1998). The active flow fields on Io provide important clues to the emplacement of ancient flood lavas on Earth and other planets. 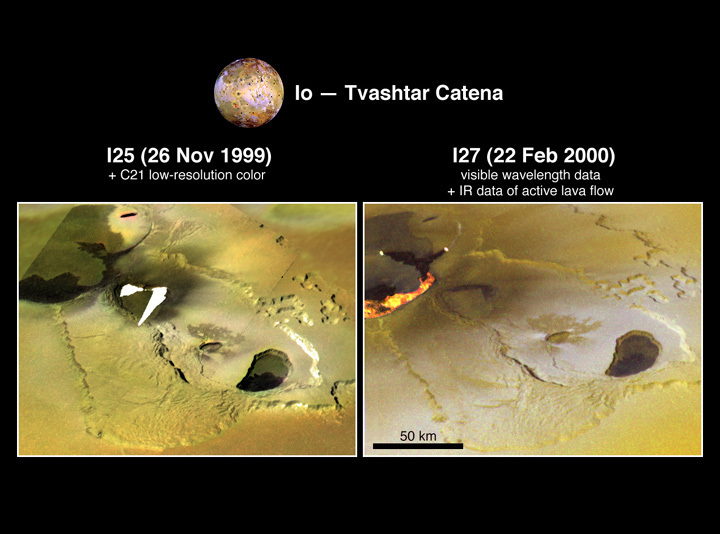 The formation and destruction of landforms such as mountains and calderas are also much more rapid on Io than on other planets, so Io is a unique laboratory to study processes normally inferred from the incomplete geologic record on Earth (McEwen et al., 2000). Gregg, T.K.P., and Lopes, R.M., 2008, Lava lakes on Io: New perspectives from modeling: Icarus, v. 194, p. 166–172, doi:10.1016/j/Icarus.2007.08.042. McEwen, A. S., et al., 1998. Active Volcanism on Io as Seen by Galileo SSI. Icarus. 135, 181-219. Lopes-Gautier, R., et al., 1999. Active Volcanism on Io: Global Distribution and Variations in Activity. Icarus. 140, 243-264. Lopes, R. M. C., et al., 2004. Lava lakes on Io: observations of Io’s volcanic activity from Galileo NIMS during the 2001 fly-bys. Icarus. 169, 140-174. McEwen, A. S., 2002. Active Volcanism on Io. Science. 297, 2220-2221. McEwen, A. S., et al., 1998. High-Temperature Silicate Volcanism on Jupiter’s Moon Io. Science. 281, 87-90. McEwen, A. S., et al., 2000. Galileo at Io: Results from High-Resolution Imaging. Science. 288, 1193-1198. Wright, R., and Flynn, L.P., 2003, On the retrieval of lava flow surface temperatures from infrared satellite data: Geology, v. 31, p. 893–896, doi:10.1130/G19645.1. Wright, R., Garbeil, H., and Davies, A.G., 2010, Cooling rate of some active lavas determined using an orbital imaging spectrometer: Journal of Geophysical Research, v. 115, B06205, doi:10.1029/2009JB006536.